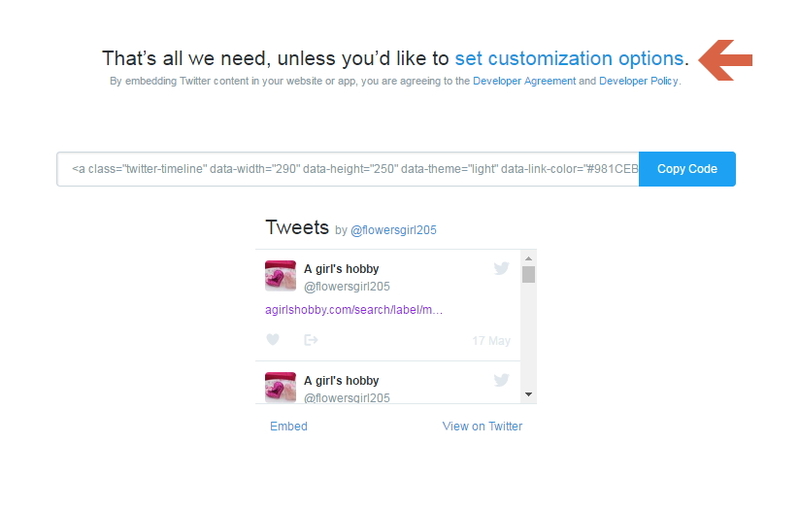 Add a Twitter Profile/Timeline widget to your blog. Twitter is a social network site where users can find updates and send tweets, these are short messages and posts. 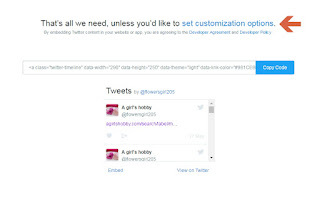 This post will show you how to create a Twitter profile widget for your Twitter account on your blog. This widget allows your viewers to view your tweets from your blog and by clicking on the widget it will redirect them to your Twitter profile where they can follow you, so when you are not posting anything on your blog and you are posting on Twitter they can read your tweets from your blog. 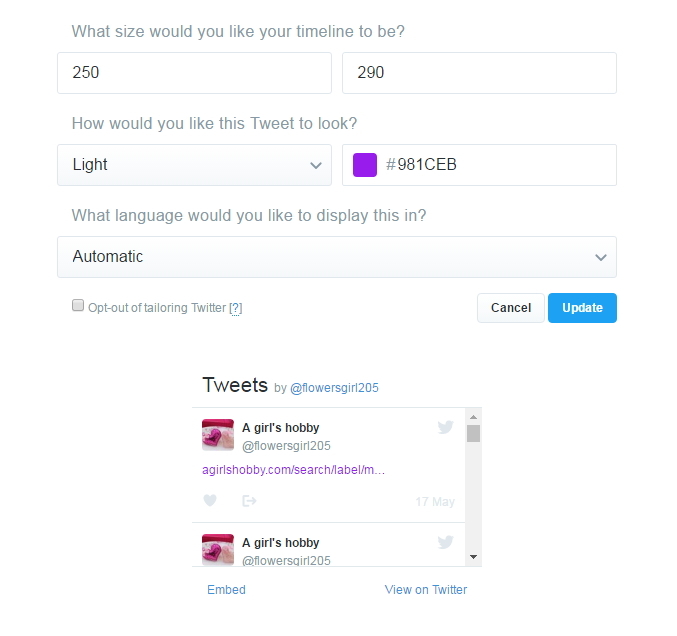 Firstly, login to your twitter account and hover over to your profile image and click onto settings. 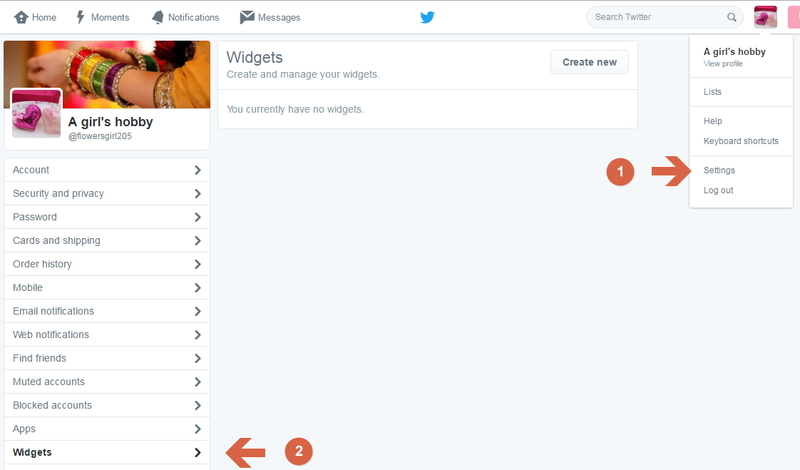 When you click on settings a list will appear on the left side of the screen from the list click onto widgets. Then click on create new following the steps below. 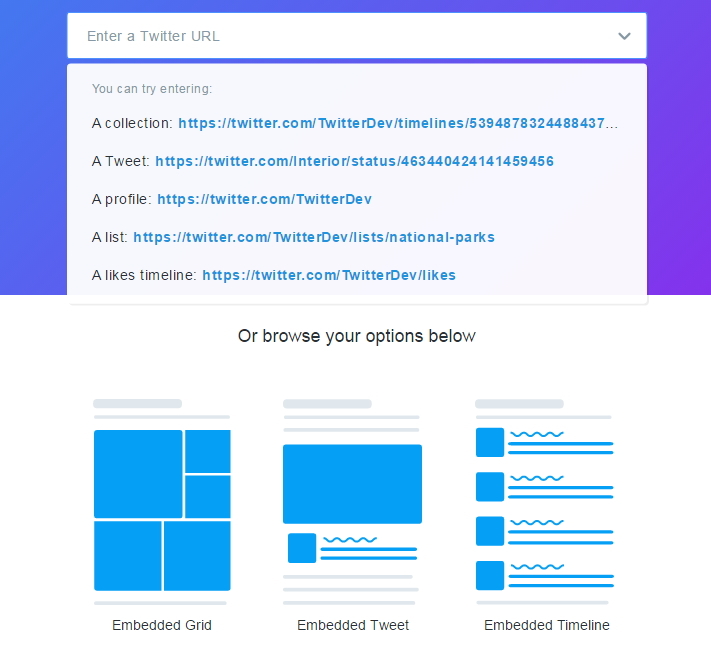 This will then take you to the widget maker page, and it will ask what type of widget do you want to make, if you want to make your profile widget to display your tweets that would be the embedded timeline or you can click on a profile and enter your twitter profile url. After you have clicked on the type of widget you want, you will see it will display a preview of what the widget will look like. The widget may look big so you may want to customise it by clicking on set customization options. This will then give you editing options like shown below. I changed the size of my widget to height 250 and width 290 because I wanted it to be small you can choose the size you want. 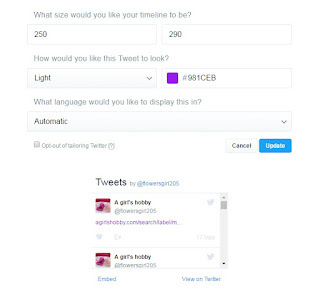 You can also change the colour of the tweets and the language. When you have changed the settings click on update. Then you are done you should see the twitter widget appear on your blog, and it will automatically update everytime you make new tweets. Also, watch the short tutorial on how to add twitter to your blog. 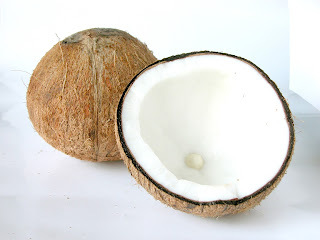 Pinterest allows their users to make widgets and add them to their blog or website, the widget helps your blog viewers connect and follow your Pinterest account. The Pinterest profile and board helps you showcase your pins and displays images. If you are looking to add a Pinterest widget to your blog, follow this post to help you build it. First, we will go through how to add a Pinterest Profile Widget to your blog sidebar (or anywhere where you want to add it). This method will also work if you want to add a board instead of a profile. Firstly, you need to login into your Pinterest Account. Then click on your Pinterest name and it will take you to your account, then click on the settings button and click onto make a widget. Following the steps below. 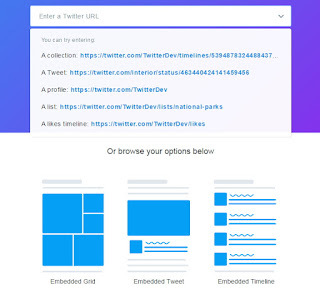 After you have clicked on make a widget, this will then take you to the widget page and all the information should already be there, like your Pinterest url and it will also show a preview of what the widget will look like. Check to see everything is the way you want it. When you are happy to carry on you will see two codes below, these are the codes you need to place onto your blog. That's done the profile widget should appear. Now, to add a Pinterest Board to a blog post. Go back onto your Pinterest account and open the board which you want to place on your blog. When the board is open, click on the 3 dots button and click on make a widget as shown below. This will then take you to the widget page where all the information is already put in place for you, but just double check you are happy with everything and copy the first code. To add that code to your blog post and display your board, go to your post and switch from compose to HTML and enter the code where you want the board to be shown and it will appear. You are done! 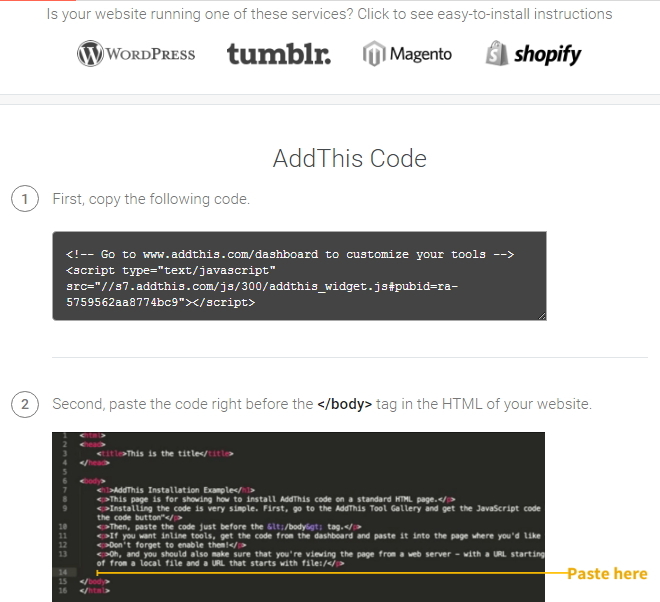 you don't need to copy the second code because you have already entered that code onto your blog once, it is only needed once. The Pinterest widget should appear on your blog and it will automatically add new pins when you update either your profile or your board. 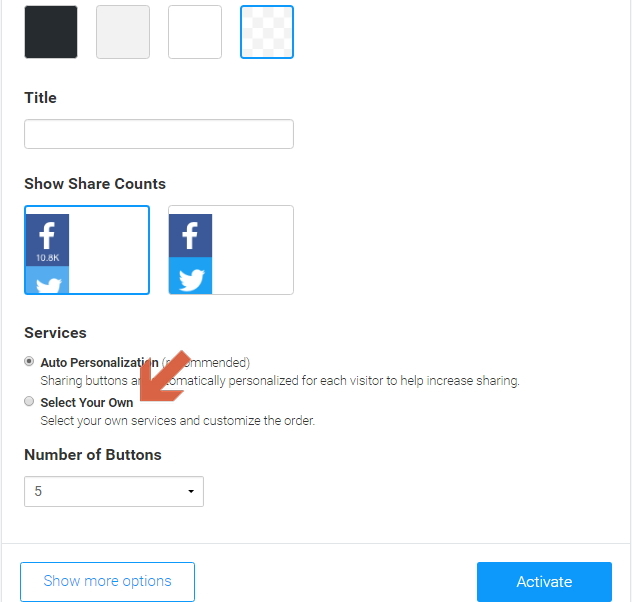 If you have a blog and you want to add social media sharing buttons for your blog posts, this post will show how you can do that. 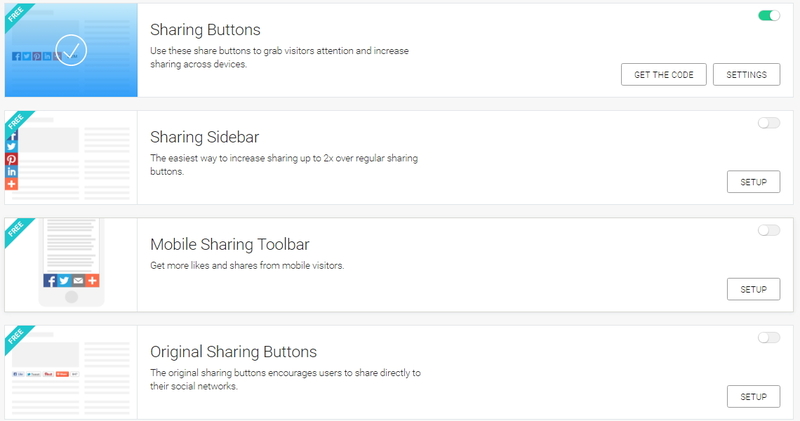 Using sharing buttons on your blog is beneficial, it can increase traffic because if one person shares your post on a social media platform, your posts can be shown to others and can bring in more visitors, as well as increase sharing across devices. It's really simple to set up and it takes about 10 minutes to set up or even less. 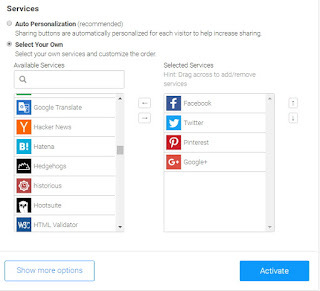 I tested out as many sharing buttons I could from different websites that offer this service including AddThis, Addtoany, ShareThis and I picked out the best one, which was AddThis. My favourite and the one I use is AddThis, this is because it has a lot more platforms than any other service including, WhatsApp, all Blogging platforms and all of the Email platforms. Also, note that you can use a number of sharing buttons on your blog using AddThis. First of all visit the website www.addthis.com/register and it will ask you to register an account, you can register using your email address or Facebook, Twitter or Google. 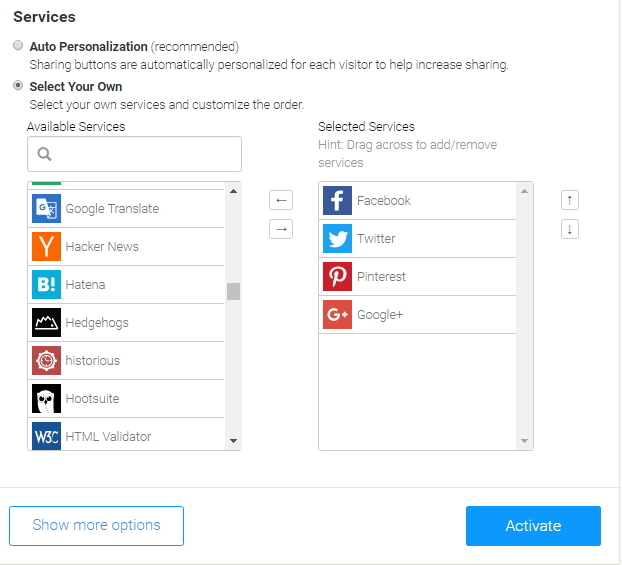 After you have signed up you need to choose what type of sharing tool you want they have free and pro services, the free services are absolutely free and they are the ones we want to use to setup, the pro services you have to pay for using their monthly plan. 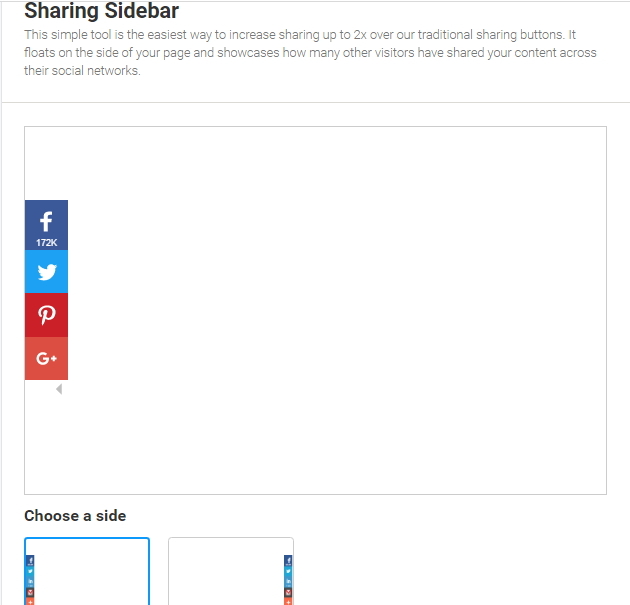 If you want sharing buttons, underneath your blog posts the first option sharing buttons is that. If you want a sharing sidebar then the second option. If you want to add sharing buttons for mobile version then the third option. All the free options explain what they are and how they will benefit you. When you have picked your choice, click on setup. It will then take you to the setup page to setup your buttons, it will also show you a preview of your buttons. 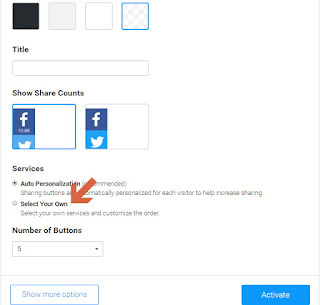 If you want to add your own customised social sharing buttons and add more or remove any from the options they have given you, click on select your own. This will then give you the option to add as many buttons as you like and allow you to rearrange the order you want them to be shown in. After you are happy with everything click on Activate down below. If you are using any of the following platforms then you can simply add the code to that platform. 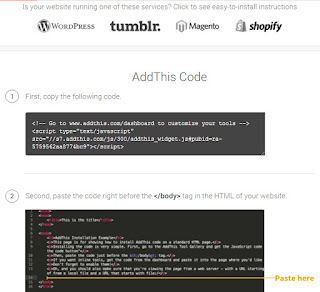 If you are using blogger or another platform or website all you need to do is copy the code given. 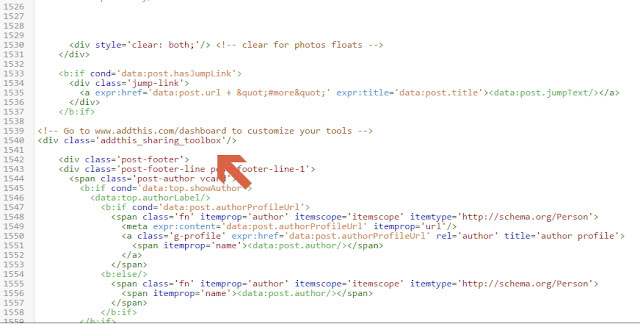 Go to your blog, then click on Template, Edit HTML. In the HTML click Ctrl + F and search for </body> and paste the code before the tag. It will display two codes one near the middle of the HTML, and one at the end of the HTML you want the one that is in the middle, so the first tag code. Then paste that above the html code, the HTML should be similar to the one below in order to have the sharing buttons in the post footer. If you want them in the header then simply replace the post-footer code with post-header and enter the code above it. Then that's it you are done! 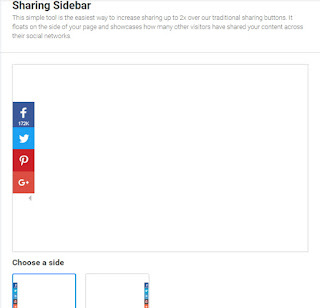 You have added sharing buttons to your blog and they should appear when you save your template. 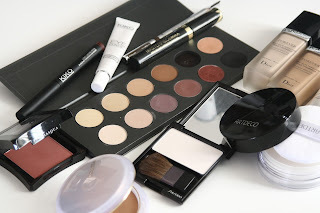 This is a step to step guide on how to apply foundation and concealer, these tips will hopefully make you more knowledgeable on how to apply foundation and concealer, which are the first steps when applying makeup. It will also be easy for makeup beginners to follow and learn these tips and tricks to apply their foundation and concealer correctly and perfectly. Before applying makeup the most important thing is to make sure your face is clean and fresh and your hands because you may use your hands to apply as well, so start off by washing and cleansing your face, to remove any dirt or old makeup. You can do this with water and facial wash or with a makeup remover. After that you want to make sure your face is moisturised by using a moisturiser, and using a sunblock can also be beneficial, or if you think you need to include it in your routine. If you want your makeup to last long a face primer can also be considered but this optional. The things to consider before choosing the right foundation are choosing the right shade that matches your skin tone. If you are having trouble choosing the right shade I suggest you buy 2 or 3 shades which you think are near enough matching your skin type this could be starting from the lightest and ending with the darkest and then from them you can pick which one suits you best. You can test the foundation on your neck/jawline and face to see which one closely matches your skin colour. It's also important to blend the foundation to see if it truly matches. Choosing the type of coverage is also important so you can achieve the end result you are wanting, the options are sheer, medium or full. If you want a natural look you would probably want to use a sheer foundation which looks natural on your face and gives less coverage, if you want a medium look this will be kind average coverage and for a full face coverage would mean a full foundation face. 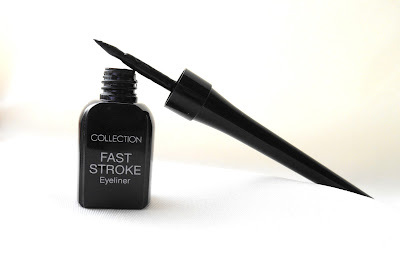 Lastly, the type of finish you want, a matte finish is suited for oily skin type because it hides the oily skin, dewy finish is suited for dry skin type because that type of foundation gives your face a glow, and a satin finish can be suited for nearly all skin types. There is also compact powder which is a powder foundation, which is normally used to give the foundation a setting. Foundation is totally optional if you only want to cover some areas on your face you can do that only using a concealer and using it on the areas that need it like, around your nose, under your eyes and on the chin. When applying foundation you need to make sure you are using the correct equipment to apply which suits you. There are different ways you can apply foundation this includes fingertips, stippling brushes, flat brushes, beauty blender and sponges. You can use one of these methods or you can use more than one it's totally up to you. 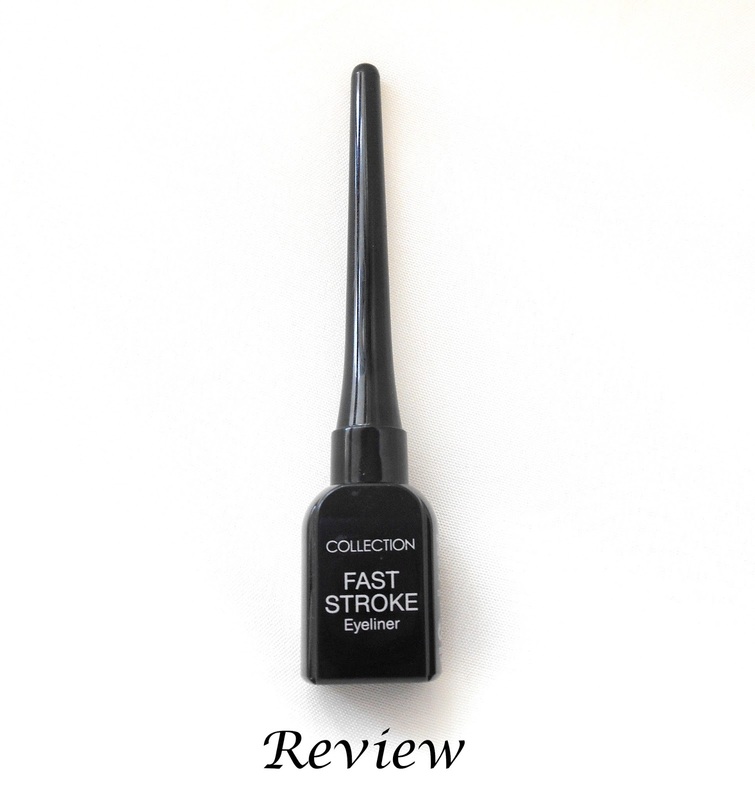 Some prefer applying concealer first and then foundation, whereas some prefer foundation first and then concealer, to find out the best way for you is to simply trial and error to see which method is most successful for you. Apply gently to the areas you want to apply the foundation on, if you think you need more you can always add another layer of foundation but one or two layers should be enough. 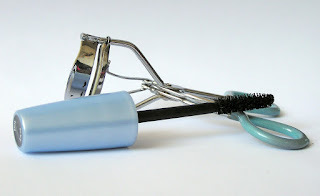 If you need to hide any blemishes, dark spots or circles, you can do that by using a concealer again use a concealer that matches your skin colour perfectly, but also the one that has full coverage, apply it to the areas where the discolouration is, you can use a concealer brush or your fingertips to apply this. 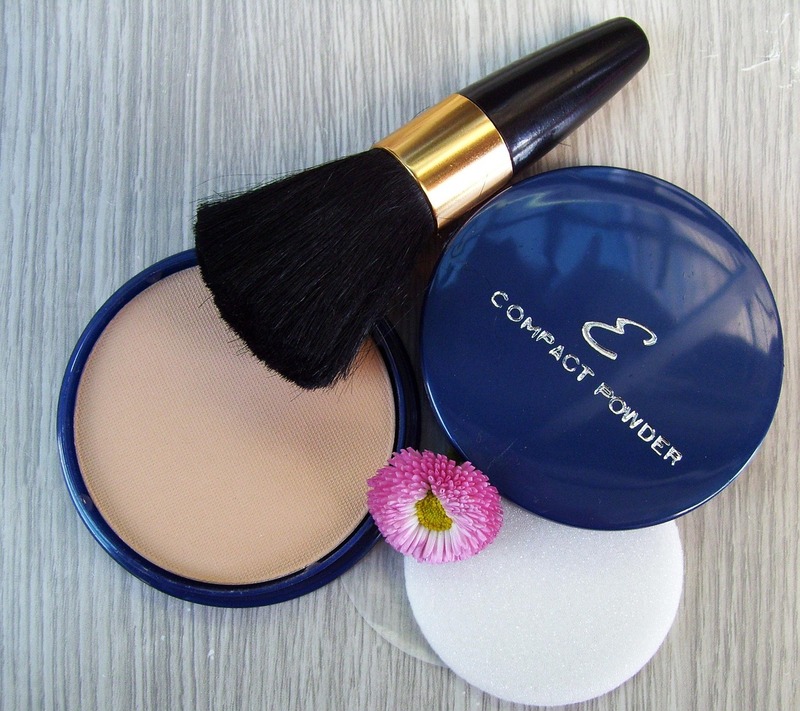 Setting powder/compact powder can be used to set the foundation and concealer, as well as, setting sprays can also be used after when you have finished with applying your makeup, hold the spray a small distance from your face and lightly mist the face. Check out my Pinterest Board Makeup Tips where you can find images that contain makeup tips in images.